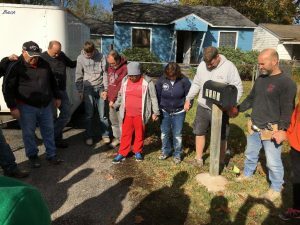 Kevin Smith, a member of Ashland Grace Church, a Charis Fellowship congregation in Ashland, Ohio (Dan Allan, senior pastor), took teams to Houston in October and December to repair homes still needing work after last fall’s storm. In December, the Ashland Grace team was joined by volunteers from two other Charis Fellowship congregations: Penn Valley Church and Grace Church at Willow Valley, Lancaster, Pa. (John F. Smith, senior pastor). The original plan was for the team from Ashland Grace to partner with Penn Valley, but God had other plans. Some of Willow Valley’s projects fell through, so they joined forces with groups from Penn Valley and Ashland Grace. Together, they made a team of 26 people. They worked on two main projects: drywall and electrical. Since the homes were so damaged, it was the perfect time to improve them. In one community, the water rose to four-and-a-half feet. 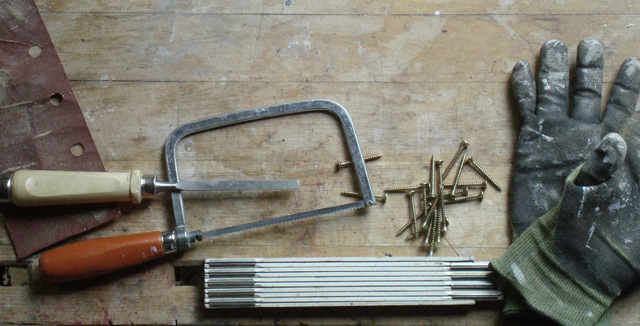 Between tiling and drywalling, the team impacted 10 different homes in just a week. They also installed a few kitchens, including the tiling, cabinets, and sinks. 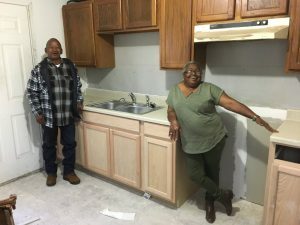 There was one couple, Larry and Nadine, whose kitchen was unable to be completed as planned. “I told them to pray that God would provide, and that if I ever return and the kitchen isn’t taken care of already, I’ll make sure I get it done,” says Smith. That evening, the team’s return flight was cancelled. Smith saw this was God’s way of providing for Larry and Nadine. Some homeowners stuck around to help while their homes were being fixed. Mr. Percy, an 82-year-old man who lived in his home for 40 years, was particularly impacted by Smith. The team spent three days working for him. At first, Mr. Percy seemed thankful but apprehensive, but as time went by, his attitude changed. Smith saw this as the perfect opportunity to proclaim the love he was looking to share. Smith went on to share with Mr. Percy about loving one’s neighbor from Matthew 22. Smith is planning to go to Houston again in March as there is still much to be done, and he has made it his goal to spend more time sharing with Mr. Percy. Click here to send a note of encouragement to Kevin or for more info about any upcoming trips to Houston.